San Tomà is on the Grand Canal, near the Campo San Tomà (one of our favorite small squares in Venice, with a pleasant bakery run by two sisters). The large and impressive Frari Church is only a few blocks away. The most notable hotel in the immediate neighborhood is the Palazzetto Madonna (four stars), which overlooks a quiet fondamenta and canal slightly inland from the vaporetto station. Ca' San Polo (B&B) is also within easy walking distance. 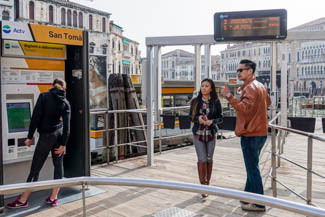 Note: San Tomà has an ACTV vending machine (but no ticket booth) where you can buy vaporetto tickets and Tourist Travel Cards.